Bob Trumble suffered a simple slip and fall 6 years ago that changed the course of his life. After regaining consciousness from his fall, he could not move. His spinal column was pinched due to the angle of his head during his fall and the following period of unconsciousness. 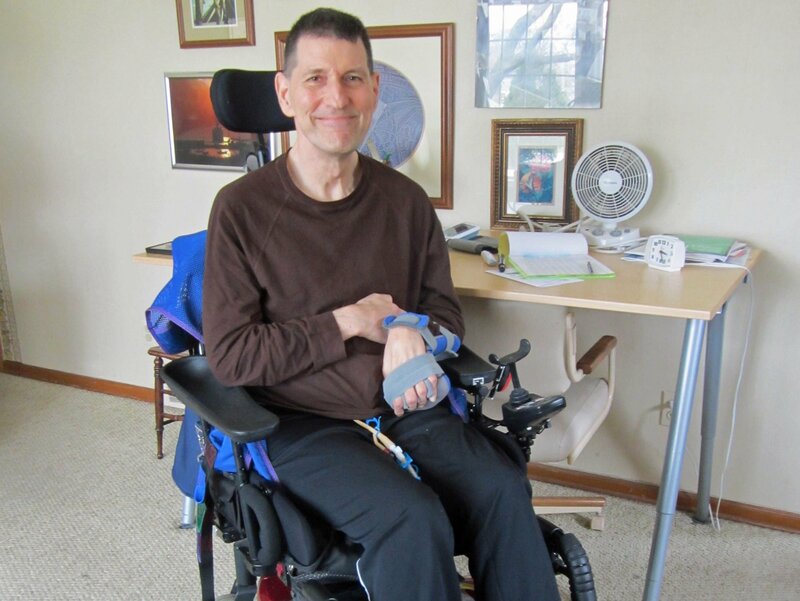 After an air ambulance evacuation to the University of Michigan Hospital NCIU, spinal surgery relieved the pressure on his spinal cord, and some sensation to Bob’s limbs returned. A long road of recovery faced him. After several months in a rehabilitation facility, Bob was able to return home where he receives 24-hour care. His friends organized the remodeling of his bathroom and bedroom to accommodate a hoist, zero-entry shower and hospital bed. He travels to physical rehab sessions in a public handicap bus service. Over four years, Bob’s entire life savings, earned as a foreign-language resource specialist in Dearborn Public Schools nearly 30 years, have been depleted. Bob is in his seventh year of retirement and was looking forward to many years of travel and adventure, and the opportunity to use the many languages he speaks. All of that has changed. Bob is a power-wheelchair traveler now, and his scenic views are of his backyard. He cannot prepare his own food or maintain his personal hygiene without help, at debilitating expense. Friends have pitched in with home cooked meals, wading through insurance forms, and figuring out his medical expenses and remaining finances. One thing is for sure: Bob’s Social Security, pension and insurance benefits do not begin to meet his monthly medical expenses and in-home care costs. He is single and has no immediate family in the area to help him either physically or financially. The supreme irony: Bob was the primary caregiver for his parents in the home where he now lives. His father was wheelchair bound until his death only seven years ago. Bob had recently removed the handicap modifications and sold the wheelchair lift van when his own life changed in one tragic slip. After many years of helping others – from his invalid parents to the many English as a Second Language students in the Dearborn Public Schools, Bob now needs our help. Please contribute generously to enable Bob to continue his long road to recovery. I hope you are doing well. I am undergoing some financial difficulty at the moment while I try to get some more funds to liquidate to cover my maxed-out Visa. I thank Visiting Angels, my 24-hour caregivers, for their patience in paying off overdue bills. For those of you who have given generously to my Help Hope Live account in the past 4 years, thank you. I have pretty much used those funds to pay overdue bills. can help with arranging fundraisers. Photo exhibitions, fundraising concerts, and many other possibilities. I have been unable to attend my therapy sessions since February, due to insurance problems.I am hoping to return soon, but rather than face a continued long time without therapy, I am hoping that you can help by donating some funds. I have no more available trips to Walk the Line, my therapy place, until at least next year. I hope to arrange weekly trips there but must pay my own way. Insurance will not cover this. I am waiting patiently to return to my therapy at walk the line..
My insurance had denied it, but the excellent walk the line staff successfully fought the denial of coverage. Hi hope everyone is doing well. I walked 800 feet yesterday. I Walked 800 feet today at walk the line. Also stood for one full minute unaided at the end. Bob wish we lived closer so we could help you at this time. We have set up a small monthly donation that you will recieve. Hope it helps in some small way. You cousin Mark prays and thinks about you often. Hang in there buddy. Bob, I'm so sorry to hear of your struggles but still hopeful that you'll recover and be able to get around easier. You're such a wonderful person. Hi, Bob. Glad to see you are on the mend. Our EL department is growing, with over 9500 English Learners! Our thoughts and prayers are with you. Hi Bob, I'm so glad that you sent me an email letting me know of your campaign! I am honored to be able to offer some amount of help. You are such an inspirational person, always positive, kind, friendly and hardworking. I enjoyed every minute that I spent working with you! I wish you the very best and hope to see you sometime! I agree with Susan's kind words and am happy to make a contribution....thanks for all your work on the reunions. Member of the 1964 Michigan Youth Chorale. Your friends in the YFU Chorales (including five reunions) will never forget how instrumental you were in the success of our reunions. We are so grateful for all you did and for getting a chance to be in your life. I am proud to contribute to such a giving, caring person as you have been, Bob. We need more people like you in the world! God bless and keep you in your recovery. Wishing only the best for you, Bob. It's my privilege to chip in, Bob. You have been valiant in your long recovery efforts! Hope we can help by offering some support. Bob, best wishes. I'll spread the work. Bob: I'm sharing your story and hoping many will respond. Spreading the word. Hoping for the best. Hi Bob, Thought I would get the ball rolling by being the first to sign your guestbook. See you soon.